Measure M would increase the countywide sales tax by a half cent and extend the Measure R half-cent sales tax beyond its mid-2039 expiration date to fund a number of transit, highway, pedestrian and bike projects and programs. To learn more about Measure M, click here. To see the timeline of Measure M projects and programs, click here and scroll down. I know I am sounding like a broken record, but these are essentially the same comments I have had several times before. First off, the link to http://theplan.metro.net/wp-content/uploads/2016/08 on http://theplan.metro.net/#objectives still does not work (the former page apparently does not exist!) You have been told about this now several times and yet your IT staff has yet to correct this. 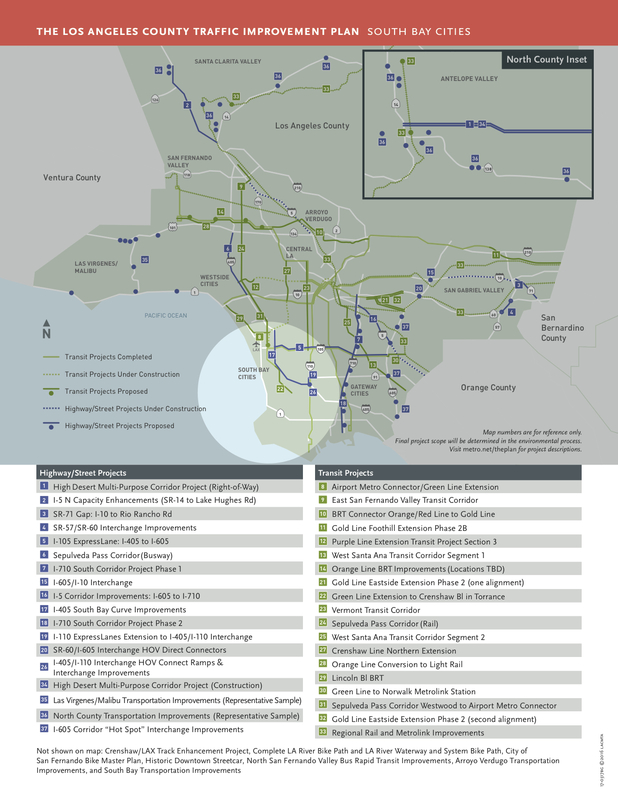 Second, once again, the second pages of the projects for individual sub-regions , e.g., http://theplan.metro.net/wp-content/uploads/2016/09/FactSheet_South_Bay.pdf, are cluttered with a map of LA County and listing of ALL proposed projects and not only those planned for a particular sub-region. In addition, you need to expand the the descriptions of the projects for a particular sub-region in a manner such as is described above for Torrence, including the dates. I am glad that at least in this article you have included the dates. However, you still need to flesh out the descriptions of each proposed project, with maps and/or sketches for each and projected start and operational dates.. The reader should not have to go to two or more sites to see what is planned for his/her sub region. The descriptions MUST be identical between all web pages.